MacroMania: What is a "Responsible" Homeowner? Many American families bought their homes at or near the peak of the house price boom. "Through no fault of their own" (individually, not collectively), house prices collapsed. 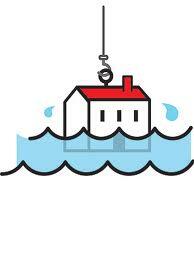 Many of these families are now "underwater:" what they owe on their mortgage exceeds the market value of their home. Some have lost their jobs and can no longer afford to make their monthly mortgage payment. Others can afford it, but are walking away from their obligations. Still others seem to be doing the "responsible" thing: they continue to service their debt. Shouldn't we (the rest of society) do something to help "responsible" homeowners? Perhaps so. But first we have to ask what exactly constitutes a "responsible" homeowner? President Obama has someone like Val and Paul Keller, of Reno, Nevada, in mind. Diana Glick talks about their situation here: Obama's "Responsible" Reno Homeowners: Are They? A quick summary. This couple bought their Reno home in June 1988 for $127,000. Their home is currently valued at $100,000. They currently have a mortgage worth $168,000. At first blush, this seems strange. Assuming a normal down payment and paying off the mortgage for 14 years, shouldn't the current mortgage be much lower? Indeed, should it not be lower than $100,000 (in which case, they would not be underwater)? Are the Kellers "responsible" homeowners? I am not sure that anyone is in a position to pass judgement on how they chose to manage their wealth. I am happy to label them "responsible" homeowners. I'm just not sure why society should necessarily be obligated, in this case, to enact a wealth transfer in their direction (away, for example, from yours truly, who foolishly chose to rent a small town home 2000-2009, instead of living the American dream). Another argument might be made on the "debt overhang" theory of "deficient aggregate demand." Evidently, people like Val and Paul Keller cannot spend as much as they would like on consumer goods and services because they are instead "responsibly" paying their mortgage (presumably out of retirement funds, since Paul is retired). Yeah, well, I don't know about that (and I still can't help wondering what happened to that $127,000). I'd also like to know how the Fed adopting a NGDP target is going to help Val and Paul in their retirement years. So the morality play obscures the forest for the trees? Did you really feel the need to share this lonely thought with us, anonymous? Well apparently yes Mr Scold. some of your math is slightly off: the 178 was the *total*, some of which went to repay the older mortgage, and only $51k was cashed out. Thats why at the time the equity was 30% (178/250k) and why they owe 168 now. there is no remaining 127k (I that was the balance on their older mortgage which went away). However, this is a straw man on many levels. I dont think Sumner or Beckworth (nor me or anyone else) are saying ngdp is a a bailout of bad decisions. Quite the opposite here (more on this later, gotta run). Also, you don't retire with debt so they must have some assets somewhere, and clearly they are current on their mortgage or they would not be eligible for the refi program. If they are both retired and receiving a pension or SS, I don't really see how "ngdp targeting" helps them much. If we move to a somewhat higher growth path (close the output gap) - that might help their retirement assets but again that's an independent issue. I gotta run, but i have some other thoughts. Hmmm, they do not actually say what the 178 was used for. But if it is standard practice to pay off the old mortgage, then I stand corrected. I'm not sure what you mean about a straw man. The point I was trying to emphasize, not well enough I guess, is that mortgage relief for underwater mortgages is not as straightforward as one might imagine. People are in heterogeneous positions, and we really have no idea what most people have done with the equity they extracted from their homes. We shouldn't be judging whether people were acting "responsibly" or not. By the same token, the role for mortgage relief is not so clear. Let them work it out with their creditors. I wasn't trying to suggest that NGDP targeting was meant as a bailout. As I made clear on earlier posts, it is trying to rectify the creditor-debtor standing that went out of whack with an unexpected NGDP (price level) shock. My question is simply: how is a NGDP target supposed to help this couple? Looking forward to hearing your thoughts. Thanks! Wow - and you're a banker? No, not just a banker, but a VP?? And you're not even aware of 'standard practice' in mortgage lending?? I know you're a renter, but as a banker VP you should have at least a rudimentary knowledge of mortgage lending practices. If a person has to lie (And I think it's safe to assume you're either lying about being a VP in banking - from your profile - or you're lying about not knowing standard lending protocols) in order to present their position in hopes of winning adherents, then perhaps one ought change their position. shhh. "David A" is an alias for Nathan Fillion, he's doing research for my new 3D movie about wall street. cant you see the resemblance? did you really think a Fed economist dresses like that? maybe he should grow a mullet, would that be more betterer for ya? Lets see whats least redistributive policy. Also, let me differentiate "ngdp targeting" and "closing the output gap" (we could path target ngdp starting today with 4.5% growth which by many accounts would not close the output gap). 1. Keller's continue to pay. 2. Keller's default, the bank forecloses and resells the house (for 80-90% of value due to costs, vacancy time etc), Keller's move into a different and much cheaper place. (2) is clearly redistributive. there is about a 75k spread between the mortgage note and what the bank will get in foreclosure which gets erased. In that case some accrues to the Keller's because they move into a cheaper place. The noteholder loses $68k, and some $$ vanish as costs, opportunity costs, etc. the least redistributive policy maximizes the chance of (1). How much of that 75k spread accrues to the Keller's is hard to say, and depends on why they are still current in the first place (it could be that ngdp targeting prevents default so we are helping the bank). We should not assume that the entire 75k represents the price of the Keller's "moral obligation" to pay: Keller's are retired so credit score might not mean anything; There are real estate agents who will help with strategic default, it does not carry as much stigma to default as it used to. I think a better question would have been: what if Val is working but Paul is not. What policy maximizes (1). What if both were willing to go back to work if cyclical unemployment was lower and wages were a bit higher? or even better: what if we had been ngdp targeting back in 2004? "close the output gap": I don't think ngdp targeting per se helps the Keller's - closing the output gap (to the extent there is one) does that (if Val is working, then minimizing cyclical unemployment maximizes the odds they pay off the full mortgage. If they have assets there is the wealth effect too). "ngdp targeting" in 2004 it would have been a better solution: It makes it less likely that the Keller's got into this situation for cyclical reasons . They might have been irresponsible or Paul may work in an industry like horse and buggy maintenance that is in decline so he is unemployed for structural reasons. monetary policy cant fix that. Some borrowers got into trouble for structural reasons and some for cyclical. Ex-post monday morning quarterbacking is very very hard. If debt were indexed to total income we would know exactly who got into trouble for structural reasons and who was plain irresponsible (and nobody gets into trouble for cyclical reasons). However, debt is nominal so it makes it impossible differentiate ex-post. So it seems to me that ngdp targeting significantly reduces the likelihood this happens again. note that there is no option 3: work out a principal writedown with their bank. They would effectively have to be delinquent even under the rules worked out in the mortgage settlement for non fannie/freddie (GSE) loans. GSEs do not allow principal writedowns (sounds like theirs is a GSE loan that's why Obama is touting the refi program) and even if the GSEs eventually do offer it, the rules would probably mean they would have to skip a couple payments. So under the bizzare rules of principal writedowns, even though there are clear gains for both parties, it wont happen (actually there are good reasons why banks do not allow principal writedowns in general during normal times). dwb -- you've clearly thought this through in more detail than I have. In macroeconomic models, optimal policies depend on the details of individual wealth positions and consumption/work histories. Clearly, it is a practical impossibility to design policies in this manner. So maybe a NGDP target is part of a "second best" solution? well, yes: if we could rewrite 50 mm mortgage contracts that would be ideal, but im a pragmatist. the essence of the risk sharing IMO is that among defaults there are cyclical (noise), structural & irresponsible (signal). you want to maximize signal/noise. you cant tell who is who, but since delinquencies are still 2x normal (ie @ full employment) its safe to say the least redistributive is to eliminate the cyclical. its not clear to me which way wealth transfer goes in default. banks hold capital against #all# types (high defaults =safe asset demand). nominal debt rigidity is not the only argument for ngdp targeting, but i do believe if the fed had been doing it in 2004 on, the situation would not have become much worse than 1990-3 (also housing bust, highet ngdp growth). i dont think you can go back and right wrongs, some were irresponsible etc etc, but going forward i think the best thing is to close the output gap in a "safe" way. flexible inflation targeting would be ok, but as i said my personal preference would be growth not inflation, plus i think it makes clearer where the line is drawn (what if the fed said 3% inflation was ok, but got 5% growth and 2% inflation? do we keep going until 3%). properly framed FIT would be ok but the best framework to prevent the next mess is ngdp. i dont think its panacea, the best solution would be to make 50 mm dent contracts more flexible. at the ZLB ngdp targeting is a slightly "safer" way to commit to stimulus. also, debt rigidities is only a piece. as Beckworths post yesterday highlights, i like the "transparency" it brings to fiscal matters which would add discipline. thats arguments for anotherday. BTW, it might not have been 100% clear, but the equivalence between default and devaluation (via inflation) provides IMO the correct framework to think about "wealth transfer." default transfers wealth to the borrower (that's why they do it), as does inflation. The correct question is not "should we" but which policy does less of it. There is some small level of inflation that actually is net beneficial to the bank because it reduces the propensity and severity of default (by reducing foreclosures, it prevents a transfer). Mortgage equity withdrawl is ~64 Bn per quarter (using Q42011) and delinquencies are running 2x normal, so taking 1/2 the MEW, per year, that's equivalent to devaluation of roughly 1.5% of the total stock of mortgage debt. Inflation of course applies to all fixed rate debt not just mortgages. I think when you get to the bottom of the "wealth transfer" argument it's not clear who's actually benefiting (and it should NOT be clear without hard numbers, economics is not that easy). It could be the bank, and it depends on the level of inflation. Real growth is even better - I don't want more inflation, but I can definitely see a case that some small level of inflation is potentially net beneficial to mortgage holders (which seems counterintuitive I know, but thats macro for ya). Irresponsible. If they took the money from the cash-back refinance and used it to improve the house or send their children to college or any of the traditional used of a 2nd mortgage, then no, they are not irresponsible. If they took the money and bought a bigger car or a trip to Las Vegas or shares of Enron, that is irresponsible. Elmo, you are defining "responsible" relative to your preferences. Do you see any problem with that view? I don't think they're irresponsible but it's not clear they should benefit from a government bailout. Had they purchased the house for $250,000 in 2007, one could argue that government policies and lack of regulation led to a housing bubble causing them to pay a price for the home they shouldn't have had to pay in the absence of the government's failures. But they paid $127,000 for the house. They then used a mortgage to consolidate debt so really 70% of their mortgage was used to pay for the house and the other 30% was used to buy whatever they owed $51,000 for when they refinanced. So the part of their mortgage that was used to buy the house is only $119,000. They're still underwater but not nearly as much. I'm more interested in the fact that they only got $51,000 back on their refinance in 2007. They would have paid about $8K in principle since buying the house so they must have paid an awful lot of financing costs on their original loan and refinance to still owe $127K after refinancing. The Kellers should exercise the contractual put option embedded in the mortgage note. In other words, they should walk away. Yes, they would take a hit to their credit score, but no one should be relying on credit in retirement. The real question is why they would continue to pay? Certainly the note holder (a shadow bank? ), if he also had a put option, would exercise it and sell this (obviously impaired note) to the option writer. One structural problem in the economy is the existence of unrecognized losses in the financial system. The information asymmetry created by these impairments of collateral results in a lemons problem; this lemons problem partly explains the "excess demand for safe assets". So the Keller's default is not only the economically best and contractually available option for them, it is probably the best option from a macro standpoint. Yes, banks would need to be recapitalized. We have examples -- the nordic countries and Chile -- where fiscal capital injections at high cost to bank creditors/shareholders were the key to strong economic recoveries. i thought about that, its a good question why they continue to pay. only 30% of GSE mortgages in the 150+ LTV bucket (they are 170) are current. Since they are retired i think they probably have other assets (by the way, as part of the refi process, income and assets typically get re-verified). However: the bank or loanholder's credit models must reflect the fact that only 30% of 150+LTV loans are current (the models have no idea about the Kellers, they only know statistical averages) so the market value of the loan is certainly less than 168k. When a company has cash and can buy its debt below par, very often it does. So there is clearly a gain: if the market were efficient, the Kellers could buy back their mortgage at the market value and give themselves a nice gain. However, they cannot do that: there are very strong structural barriers (the servicer is not even the underlying note holder). so, their best option is to default. (banks generally don't give principal writedown's because of the potential impact on borrower behavior). That thought occurred to me as well. I wish that interviewers would have asked the Kellers! First, look at the victims. One or both homeowners are likely unemployed or under employed as the disaster unfolds upon them. When the home mortgage was taken out, there was mortgage insurance taken out by the lender to protect himself in case of a loan default. Even though the premium was paid by the borrower, the insurance is to protect the lender against the borrower. So the lender is protected. Period. The person not protected is Mr. & Mrs. Do-gooder who try to hang on to their dream home by draining their savings and even maxing out their credit. What they both need and want is a good enough paying job to earn their way in life. In times past, like the FDR era, the government was the employer of last resort or some qualified government contractor who would hire them upon being awarded a government contract. There is a problem doing this again? I think not. I have a problem with interpreting debtors as "victims" of their creditors. Why not pass legislation prohibiting all debt. No more victims. Obviously, this cannot be what you have in mind. The "victim" language does nothing to promote understanding here, imo. As for your concluding remark about the government as an employer of last resort, I'm not completely against it. Not sure it would work in the Kellers' case, as they are retired. But in general, I can see some merit in the idea. Of course the victim here is not a victim of credit, creditor, or himself. He is the victim of job loss or more specifically, income loss. That is what is the root cause of him being a victim of losing his house. Surely losing one's job and income is not a sought after reward of working for a living. Even if he had paid cash for his house, a long period of drawing on the asset of his house value through loans would still result in a loan default. No, the root cause is his job loss. And the cure is to make a job for him instead of passing that action to some vague "someone else." What's stopping you from giving that guy a job, John D? Yes, I know it's you, you useless twit. Unless there was another refi the amount taken out was more than 51k since there had to be a down payment. Assume it was an FHA at 3.5%, then the original principal was 122500 (plus or minus closing costs) in 2007 an amortization calculator shows that the balance would be in the neighborhood of 105k. Thus 178k-105k yields about 73k of cash out. The thing that leads to this sort of behavior is the mortgage interest deduction, as you can deduct up to 100k of balance not due to the home purchase. It is cheaper to have uncle sam pay some of the interest on other debt. Perhaps set the mortgage interest deduction limit to 0 for debt not used to buy or improve the home. We know that prices were artificially inflated by criminal fraud, since the FBI and appraisers' associations warned of an epidemic of fraud as far back as 2004--nothing was done, and the bubble kept inflating. But it seems to me that there is no reason that banks should not take a haircut on criminally inflated prices and mortgages: there is no moral hazard in giving honest borrowers (and we must distinguish them from dishonest applicants making liars' loans) redress from fraudulently inflated prices. If you could explain this dimension to the public--I have yet to hear it explained on NPR or Marketplace, which I hear every day--the Santelli-Tea Party moral hazard rant goes away almost entirely, and we could begin to give defrauded homeowners real relief: the number one thing the economy needs to recover. Here's my question: Isn't it true that a smart economist could actually figure out an algorithm that calculated a range for a) the percentage of purchase price on a given date that was attributable to b) the amount of fraudulent bubble inflating activity in the local market at that time? This seems to me a straightforward calculation, except for one thing: because we've had no investigations, we have no good numbers for the number of fraudulent mortgage applications in a particular housing market. However, we do have estimates of the number of bad loans in the various tranches, and the numbers are astronomical: can those figures illuminate percentage of fraud in particular regions? You see what I'm after: a calculator for underwater houses that estimates what percentage of their remaining mortgage has been inflated because of fraudulent activity. If we had that calculator, used it, and explained the process to the public, I think most citizens would see the fairness in haircutting the fraudulently inflated portion of the mortgage. Can this be done? And if it could, it would take us some way towards a rational procedure for people like the Kellers (even though their situation is complicated by the second mortgage issue) that could be applied in the same way to all underwater mortgage holders. So, who has a very sharp pencil out there??? Well,I'm no lawyer, but it seems to me that issuing debt against an asset whose price is expected to continue rising may be somewhat reckless, but not fraudulent. We know how bubble dynamics work; prices boom, then crash. People who get caught with their pants down claim "fraud" -- even if they went into the deal knowing full well the risks. As for the calculation you suggest performing, I'm not sure it can be done in a reliable way. We have theories that the difference between market price and "fundamental" value may be attributable to a lot of things, like a liquidity premium. Can you pass along a reference here? The people I talk to (e.g., FDIC) claim that the actual losses on AAA subprime mortgage debt was *tiny*. The problem with the objects were not that they defaulted; rather, their liquidity vanished. Again, this has nothing to do with fraud, as far as I can see. The FRB flow of funds says from the peak in Q12008 household mortgage debt outstanding declined ~800 Bn, off a base of about 10.6 tn. Most of that is writedowns through foreclosure etc (some but very little is ordinary amortization). Is 800 Bn big or small? There was a lot of fraud (liar loans), most of it was in the "low doc" or "no doc" loans. here's a hint: if someone wants to borrow money without some income or asset documentation, *they are probably lying*. Bank models assumed these had *average* characteristics. They should have assumed they had *horrible toxic* characteristics and been forced to hold 100% capital against them. nuff said. Banks do have sophisticated algorithms these days to try to detect fraud (e.g. in flipping). You see what I'm after: a calculator for underwater houses that estimates what percentage of their remaining mortgage has been inflated because of fraudulent activity. Kevin is talking about "bad loans in various tranches." He says that the losses in this securitized products was "astronomical." Not sure what "liar loans" have to do with this. In any case, I think he is wrong. The AAA tranches did not default (for the most part). Lower tranches did. But that's what it means to be in a lower tranche -- there is risk. Not sure what this means in terms of "fraud." I am agreeing that we cannot deduce "total fraud" from estimates from various tranches. When pools are put together, they contain both good and bad stuff, so as you point out, the AAA tranches had low losses while the bottom suffered most. You have to look at the *total* of what was put in the pool. Lets say for example the pool is 90% fraud and 10% excellent, and you own a AAA tranche that collects the first 5% of cashflows. Chances are you are still getting paid even though most of the pool is crap, because you are in the front of the line every month. Plus, not all mortgages are put in securitized pools, its not the securitization per se. I am saying that the best way at a high level to look at fraud is by *product type* not tranche because products tie back to underwriting and origination standards. For example, FHA, Fannie, Freddie loans are generally stringently documented. There might still be fraud but its a lot more work to forge all those documents and steal someones identity and get through all the other checks. The private label "low documentation" loans were where the fraud was concentrated - there was a lot of poor credit etc. in subprime pools, but criminals are lazy so much of the outright fraud was in the "low or no documentation" products. The low and no documentation products were nicknamed in the industry "liar loans." At some point in 2006 over 50% of subprime was low/no doc. The bottom line though, as you said, is that you cannot tie average home prices in a neighborhood directly back to fraud. home prices are much more correlated with economic variables like unemployment/gdp than particular fraud cases. dwb: exellent comments. You should start blogging! dwb, I concur with David Beckworth! David, the "shared equity solution" is an intriguing idea. One question that immediately pops to mind, however, is how ex ante behavior might be affected. yeah the shared equity idea is a fantastic one and a lot of people in the industry have been pushing it, unfortunatly there is also a lot of equally strident opposition within the GSEs and FHFA (and banks who do not want to be sued and consumer groups who was to make sure people are not cheated...). Fannie/Freddie was ready to start a pilot in 2010 with Citibank but the idea was killed due to FHFA & servicer opposition. Democrats are investigating, Republicans are opposed. It's a mess. Yes, it might distort future behavior. Former Fed governor Randy Krozner has a paper where he argues that benefits outweighed the costs of large-scale debt forgiveness. Abstract below. What a pointless, totally pointless conversation, by people lacking the emotional maturity of most 5 year olds. This topis is relevant only to the extent it corroborates yet another failure of markets. Markets never ever are fair or just. The world, economically, is a giant super fund site. Those responsible are not going to pay (and if you tried to make them David would be the first to rush to their defense). David, BTW, Delong just posted, making the same point. David, as I have written before, I believe you are a nice, well intentioned person. Unfortunately, you appear to work in a cesspool and you get off track, a lot. Because you are not American I doubt you will fully comprehend the following remarks. The American Constitution has deep organic flaws which are not self correcting against right wing idiocy and mendacity. We are in a political situation no different than the 25 years after 1840, leading up to the Civil War. Our government is broken and cannot fix the problems we face (or that the World faces). It is going to end very badly, in a Deep Depression of Deflation and massive unemployment followed by a combination of the Civil War and French Revolution. In the end, we will be an outpost of China.